What District Leaders Should Know About Veterans' Preference in School Districts - Each November school districts across the country host programs teaching students to honor veterans for their service. For many districts, depending on their state laws, honoring and recognizing the service of veterans doesn’t wait until November. Veterans' Preference in school districts allows districts to recognize veterans in human resource decisions throughout the year. Each November school districts across the country host programs to teach students to honor veterans for their service. For many districts, depending on their state laws, honoring and recognizing the service of veterans doesn’t wait until November. Veterans’ Preference in school districts allows districts to recognize veterans in human resource decisions throughout the year. Too often though, knowledge of Veterans’ Preference in school districts remains low and it’s a topic worth discussing to ensure your district is compliant, and more importantly that it provides select veterans with employment opportunities to serve their community after they have served their country. This is an information packed article. If you notice at the top of the page there is a sound bar. We were able to record a podcast interview with attorney Sean Timmons. Mr. Timmons works with the law firm Tulley & Rinckey and is a veterans’ preference legal expert. We have linked to the firm and you can call them directly at (855)-248-9790. The information he shares extends well beyond the information you will find in this article. We highly encourage you to listen to this episode after you read this month’s article. 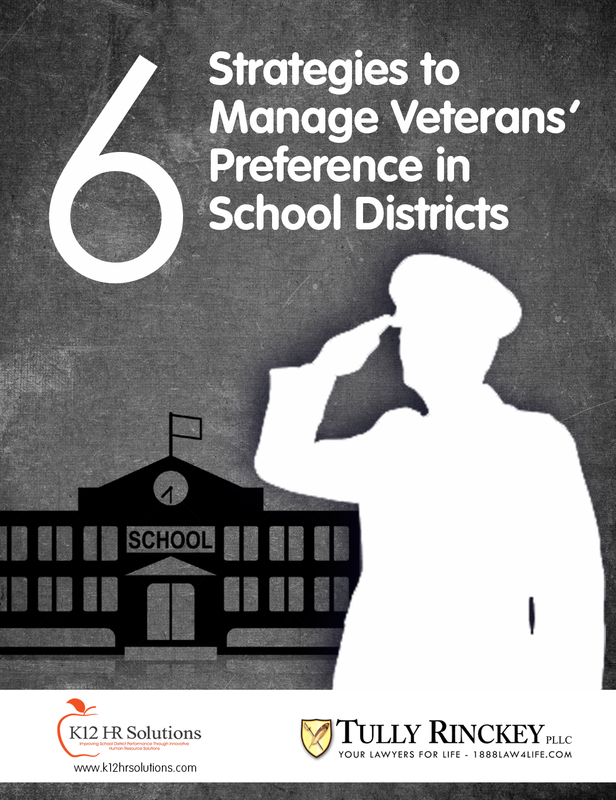 What is Veterans’ Preference and Why Should School Districts Care? Veterans’ preference was initially established as a set laws created by the United States Congress to assist veterans seeking Federal employment and to prevent them from being penalized for time spent in military service. These laws provide preference points for employment and other human resource decisions to veterans who are disabled or who served in the Armed Forces during specified periods or in designated military campaigns. Veterans’ preference laws do not guarantee veterans a job, nor do they give them preference in internal actions such as promotions, transfers, reassignments, and reinstatements. It is also important to note that not every veteran is eligible to receive veterans’ preference. Veterans’ preference laws for Federal employment and most state veterans’ preference laws only provide preference points to veterans who meet specific criteria, who are disabled, or who served during specified periods or in designated military campaigns. Additionally, the number of points awarded to veterans depend on a number of factors. That will be addressed later in this article. Beyond the obvious reasons related to recognition and honoring the service of veterans, school districts should care about veterans’ preference because many states have passed laws that require public employers to provide veterans’ preference in hiring decisions. Veterans’ preference was initially created to provide opportunities to veterans seeking federal employment. However, over the past few decades more and more states have adopted or modified veterans preference laws. Failure to comply with these laws can result in costly lawsuits and even worse, a damaged reputation of the school district. A few of the most notable veterans’ preference lawsuits against a school districts are discussed below. Merrell asked the trial court to order the School District to hire him as a social studies teacher as of the 1997–1998 school year and to pay him backpay and lost benefits. The district maintained that it had an obligation to hire the most qualified teachers and the authority to exercise its discretion in deciding which applicants were most qualified. The School District contended that they had a well developed employee selection process that ranked applicants on a variety of factors and that Merrell was not a qualified applicant entitled to veterans’ preference because he was not one of the top three applicants in 1997 and was not within one of the nine highest rated candidates in 1999. The School District insists that there was no flaw in its hiring process and that the interviewers did not act in bad faith. The case came down to interpretation of the statute and the design and use of the district’s teacher hiring tool. When the selection process was evaluated in the lawsuit the court found this rating scale was flawed. Pennsylvania state statutes for veterans’ preference require that applicant “possesses the requisite qualifications.” According to the rating method used by the district, any candidate with a rating of “3” would meet the definition of “requisite qualifications.” Had the district used a different type of rating process they may have been able to defend their case more easily. The court ultimately found, the School District did not have objective educational criteria for a social studies teacher position. The court maintained the selection criteria was too general in nature and did not address specific knowledge and skills related to the open position. The court found that DeBoer had less than stellar performance in social studies coursework in college and that Merrell, on the other hand, held a master’s degree in geography and regional planning, which was related to the social studies teacher position. Merrell was also pursuing a master’s degree in education when he applied for the position in 1997 and was awarded that degree a few months later. In the court’s final analysis, they concluded that DeBoer’s accomplishments were rated higher and magnified by the interviewers in the district’s efforts to hire an assistant football coach. After reviewing the facts of the case, the use of the selection tool, and ratings of interviewers the court determined that Merrell’s broader experience including world travel and command responsibilities were denigrated to achieve a pre-determined end—that a recent student teacher, with football prowess and recommended by the brother of a School Board member—would be hired. Through the appeals process this case was not resolved until 2012, nearly 15 years after it the initial lawsuit. Ultimately, the courts found in favor of Merrell and the district was required to provide back pay for lost wages and benefits to the plaintiff. The case was a costly and established precedents regarding a school district’s obligation in teacher hiring tools to justify choosing non-veterans over veterans. In reference to veterans’ preference the court argued that a veteran seeking veterans’ preference must demonstrate his or her ability to perform the job at the level of skill and with the expertise demanded by the employer. Once a veteran applicant satisfies that burden, then the burden falls to the employer to establish that the veteran was not qualified. Selection processes should not be manipulated to achieve predetermined outcomes. Teacher hiring tools matter. The way districts rate, categorize, and decide who to hire can affect decisions related to veterans’ preference. Criteria used on teacher hiring tools matters. School districts must use valid, job related data and well-developed teacher hiring practices in states where veterans’ preference applies to school districts (really this statement applies to any school district). Another case related to veterans’ preference, ironically also in Pennsylvania, was Brickhouse v. Spring-Ford School District. The question the court sought to answer in this case was, when a veteran has applied for a vacancy on the teaching staff of a public school and establishes that he is certified to teach in Pennsylvania, must the veteran be hired for the position pursuant to the Veterans’ Preference when the other applicants are non-veterans? In this case Gordon Brickhouse was a military veteran seeking a position in the Spring-Ford School District. Similar to the Merrell case, Brickhouse applied for a social studies position with non-veterans and ultimately was not selected by the school district. Brickhouse filed suit against the Spring-Ford School District citing that he was not provided veterans’ preference and that he established he was qualified simply because he held a valid teaching certificate. The school district argued that although Brickhouse was certified to teach in Pennsylvania, he was not qualified to teach in this particular school district, where high academic performance, outstanding recommendations, and current references were required. The lower Commonwealth Court found in favor of Brickhouse and stated that the district may not defeat the purpose of the veterans’ preference act by recognizing other “requisite qualifications” beyond what the Commonwealth established in state statutes. The school district appealed the ruling of the lower court. In the appeals process the court determined in order to be “qualified,” veterans first must demonstrate an ability to carry out the job in question at the level of expertise demanded by the employer. The Spring-Ford School District used their selection process objectively without a predetermined end. They also used objective job related criteria to measure job candidates’ qualifications. Because of this, the court found that Brickhouse was not qualified for the job as the school district had defined it. They found the school district sought a person of high academic performance with outstanding and current references. Brickhouse’s academic record, at best, was mediocre, and he did not furnish the required outstanding recommendations and current references. Putting it another way, the school district was looking for a highly motivated, currently involved teacher who had accomplished considerable success in his teaching endeavor. Had Brickhouse met these criteria, he should have been preferred under the act. The appeals court ultimately found in favor of the school district. They found that since the applicant must demonstrate his ability to perform according to the employer’s standards. Merely having the appropriate certification or licensure, without more, would not serve to qualify an applicant for the job. The court decided Brickhouse’s assertion of qualification based on minimal age, good moral character, and certification to teach was not sufficient. Findings in the Brickhouse case established that veterans’ preference can assist veterans to be considered eligible for a position, but it will not establish that a veteran is “qualified” for the job. The lesson to be learned in this case is similar to the lessons learned in the Merrell case. That is, valid and well-developed teacher hiring tools matter, especially in districts where veterans’ preference can apply to veteran applicants. In yet another Pennsylvania case, Basile v. Elizabethtown Area School District again, the court found that the plaintiff was not a“qualified” applicant. A U. S. military veteran applied for an elementary teaching position in the local school district on two occasions, received interviews, but was not hired for the position. The veteran claimed he was denied his right to veterans’ preference in appointment to a non-civil service position. The court determined that the school district had a hiring process that was “reasonably related to the position” and the school district relied upon this process, which revealed that the veteran was not qualified for the position. Therefore, the school district did not violate the Veterans’ Preference Act when it failed to hire the veteran applicant. Both Basile v. Elizabethtown Area School District, and Brickhouse v. Spring-Ford support the idea that simply because a veteran is certified to teach in a particular subject area does not mean that the veteran has the “requisite qualifications” to teach in that subject area. “Requisite qualifications” may be interpreted to mean more than holding a valid teaching certificate, e.g. taking into consideration other factors such as grade point average, academic awards, performance evaluations and relevant experience. In the court cases discussed above it should be clear, school districts should use selection process with veterans’ preference in mind. It further reinforces that courts will evaluate hiring practices based on their validity and adherence to methods that conform to the Uniform Guidelines on Employee Selection Procedures. I wrote an in-depth article on fair and reliable teacher selection practices a few months ago. You can read it and receive the free resources we provided by following this link. Do School Districts in Every State Have Veterans’ Preference Laws? Veterans’ preference was initially created by the Federal government to provide preference for federal jobs. Over the past several decades, individual states have enacted their own versions of veterans’ preference legislation related to either civil service employment or in career fields related to public service (such as public education). Below is a list of states that have some version of veterans’ preference laws, or are considering enacting veterans’ preference laws. This list may or may not include requirements to provide veterans’ preference to school district employees. If you find your state listed below, it is advisable to research further to determine if public employees are covered under your state’s veterans’ preference laws and how preference points are awarded in your state. This is not meant to be an exhaustive list as there may be additional states that have veterans’ preference laws that apply to school districts. Anytime we work with school districts to assist them in developing teacher and administrator selection practices we consult with the school district’s legal counsel and state statutes to determine how veterans’ preference applies in that particular state. We would advise any school district that is not familiar with the state’s veterans’ preference laws to do the same. Who Can Qualify for Veterans’ Preference in School Districts? Criteria according to the Office of Personnel Management (OPM), to receive preference, a veteran must have been discharged or released from active duty in the Armed Forces under honorable conditions. However, military retirees at the rank of major, lieutenant commander, or higher are not eligible for preference in appointment unless they are disabled veterans. The following preference categories and points are required under the OPM. Many states use these guidelines in their veterans’ preference legislation, but again we would advise school districts to research their own state statutes to determine how veterans’ preference points are awarded in their respective state. The point system outlined below has been summarized for the sake of brevity. The OPM guidelines on veterans’ preference are more specific and their guidance for veterans’ preference points can be found using the provided link. During a war; or during the period April 28, 1952 through July 1, 1955. The five point preference also applies for those who served for more than 180 consecutive days, other than for training, any part of which occurred after January 31, 1955, and before October 15, 1976; or during the Gulf War from August 2, 1990, through January 2, 1992. More recently, the five point preference can also apply to veterans who served for more than 180 consecutive days, other than for training, any part of which occurred during the period beginning September 11, 2001, and ending on August 31, 2010, the last day of Operation Iraqi Freedom; or in a campaign or expedition for which a campaign medal has been authorized. Any Armed Forces Expeditionary medal or campaign badge, including El Salvador, Lebanon, Grenada, Panama, Southwest Asia, Somalia, and Haiti, qualifies for preference. Ten points are added to the passing examination score or rating of a veteran who served at any time and who has a compensable service-connected disability rating or any veteran who received a Purple Heart. Veterans preference points may also available to spouses and mothers of veterans who meet specific criteria. Ten points are added to the passing examination score or rating of the spouse of a disabled veteran who is disqualified for a Federal position along the general lines of his or her usual occupation because of a service-connected disability. Ten points are also added to the passing examination score or rating of the widow or widower of a veteran who was not divorced from the veteran, has not remarried, or the remarriage was annulled, and the veteran either: served during a war or during the period April 28, 1952, through July 1, 1955, or in a campaign or expedition for which a campaign medal has been authorized; or died while on active duty that included service described immediately above under conditions that would not have been the basis for other than an honorable or general discharge. How veterans’ preference points are applied ultimately depend on your state. If you listened to our podcast on veterans’ preference in school districts, you likely heard him recommend that veterans should receive preference points at each stage of your selection process. With that being said, you should design your candidate scoring guides to provide a range that allows veterans to receive the points they are entitled to receive and allows them to be competitive for open positions, but with enough variance to distinguish which candidates have the requisite and related skills that have identified as essential for the position. This should go without saying at this point, if your current hiring process does not provide numeric scores that allow you to compare and distinguish candidates’ performance in the selection process, it may be time to give us a call. Once school districts determine if veterans’ preference applies to public school districts in the state, or if board policy requires the provision of veterans’ preference, the first step for compliance is the district must provide an opportunity on application materials for qualified veterans to identify themselves as such. Next, school districts must ensure their selection process is designed in a valid manner and differentiates applicants’ performance in job related criteria while accounting for preference points allowed under state law or district policy. Finally, districts must ensure measures used to hire employees are developed prior to job postings and selection processes. Ad hoc, employee selection decisions are a minefield for legal issues in school district hiring practices, especially as they relate to veterans’ preference in school districts. In school districts residing in states where veterans’ preference applies, or districts that have decided to provide preference to veterans, district must provide an opportunity on application materials for qualified veterans to identify themselves as such. Veterans may also be asked to complete a Form 15 and that requests official documentation to verify 10 points of preference related to a service related disability as well as a DD 214 and provide evidence of service or service connected disabilities in the selection process. What are the Consequences for Failing to Comply with Veterans’ Preference in School Districts? If you carefully read the court cases discussed in this article you begin to become familiar with the consequences for failing to comply with veterans’ preference in school districts. The most common consequences districts face are financial penalties and damage to the district’s public image. The financial consequences for failing to comply with veterans’ preference can vary substantially. In the Merrell case discussed above the district was ordered to provide back pay and benefits for nearly 15 years. This doesn’t account for court costs or “other damages” Merrell’s attorney may have been able to argue. While I cannot find an exact amount on the damages awarded, a conservative estimate would be a few hundred thousand dollars. Outside of financial damages, school districts that fail to comply with veterans’ preference also face damage to their public image. “Local School District Dishonors Veterans According to State Guidelines” is not a headline school leaders want to face. Additionally, once veterans preference cases begin litigation and the discover process reveals weaknesses in school district hiring practices, districts becomes exposed to other forms of lawsuits that may have had a negative impact on protect classes of applicants. 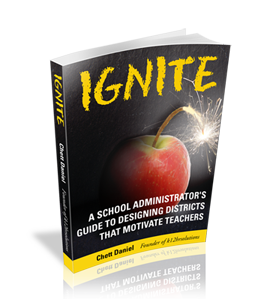 The best advice we could give here is the same advice we have already offered, and that is ensure your district is utilizing legally defensible, valid, and fair school district hiring practices. Finally, we want to remind you that this article is not meant to replace legal advice. This article is simply an informational resource to learn more about veterans’ preference in school districts and the considerations should made in your district’s hiring practices. If you feel like your district’s hiring practices need to be reviewed, please contact us and we would be happy to review your hiring practices to see if they provide appropriate consideration for veterans’ preference.